Quick! 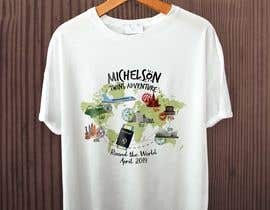 T-shirt design for Round-The-World Trip! and then something like a globe that shows the locations and maybe a dotted line and an airplane - somehow it should show that we are going around the world. It can be cartoonlike or however you want. You can use the airport codes or city names or neither. Instead, the whole design could be something like an open passport with stylized stamps from each location - be creative! See the attached photo for what I mean by Passport Stamps. There are sites online where you can get the stamp for each country. I think one or two color should be fine. I will want this in Vector format: AI. PDF, and PNG file formats. i am just working on this project.give 1 hour. Please check #38 #39 Thanks. What is your twins age? Please wait i work for it. Thanks. Hello! What about twins - the boys or girls? boy and a girl 14 yrs old, and boy and a girl 17 yrs old. Hello Dear Contest Holder, Work in progress, Please wait for my submission I will submit soon! Please Direct Message me via Freelancer.com Inbox to see the initial draft of the design hope to hear from you Thank you.